Do you know one of those days where it is just too windy to go out? When it is just too dangerous to go out ‘cos the sky is falling? One of those days where you wake up to go to school just to find out that classes have been cancelled? Or how about when you are so happy that classes are cancelled and want to just go home to enjoy some anime only to find out that there is no electricity? 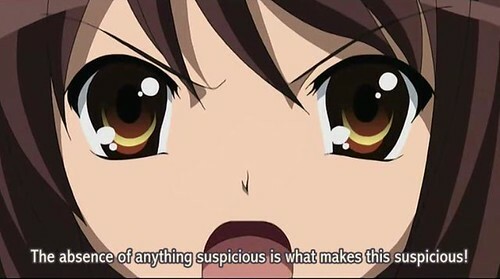 But I am watching Suzumiya Haruhi jumping around the screen. Anyway, back to interesting news. Zettai Kareshi is going to be a Drama!!!! WOOOHOOO!!! That is the manga’s description, I have no idea how closely they plan on following that storyline. When I first heard of it I was quite surprised and filled with mix feelings. Honestly, to me the characters were really sweet and handsome and so perfect that it was unrealistic, and to find people who are able to act that way and live to the expectations… that is going to be hard. The CM for the drama looks… ok… nothing special. I still think that the characters in the manga are hotter (duh!). But it is not too bad, those actors are pretty hot too. I just am curious as to why Tenjo Knight’s character is so tanned. Looks weird. I also don’t like the idea that they are making this an out of school anime. I thought that the high school plot was kinda fun. I guess the writers for this series are looking for a more adult appeal rather than teenage appeal. But still, it is starting to seem like April would be a good month to start watching all sorts of anime/dramas. Either way, I would most likely be watching this series. How about you? xxxHolic Kei is out this week (4th of April, and no, this is not an April Fools joke) and I can’t wait to see it!! It is looking good, and I hope that it would be disappointing. Amatsuki! Another animation that I am waiting to catch.